Five years ago, on Wednesday 4 August 2010, a lone power shovel began removing the first cubic metres of rock and top soil from the northern side of the ITER platform. In six months, some 230,000 cubic metres of material were excavated for the Tokamak Complex. In five years, the moonlike landscape of 2010 has turned into a bustling environment of tall cranes, concrete and rebar, and steel columns rising as high as a 15-storey building. In parallel, 250 metres away, bulldozers and scrapers were levelling the ground at the site of a large winding facility for some of ITER's largest magnets. After creating a smooth "sub-base," the concrete floor slab was poured and, within 18 months, a 257-metre-long steel structure erected. 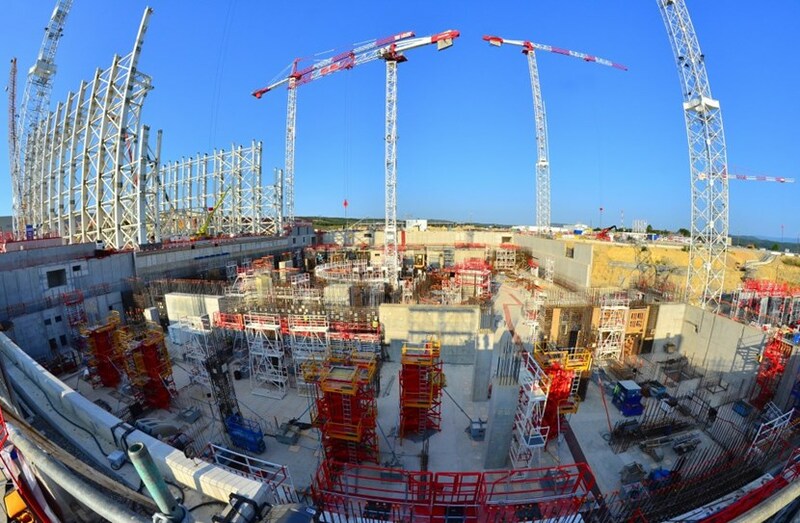 Since then, the anti-seismic foundations of the Tokamak Complex have been set into place, drainage and precipitation networks finalized, a 400 kV electrical substation installed, and progress made on the Assembly Building—the 60-metre-high edifice that will host the pre-assembly operations for ITER machine components. As Newsline closes for its traditional summer recess, work inside of the offices and on the platform will continue at a determined pace, providing us with plenty of stories to report. We'll be back in late August with our next issue!